My name is Alexander. I’m seven. My favorite ice cream is chocolate and mint. My favorite part of the story was when all of the grass were getting cut down by the mower and then the bug said, “Don’t worry, you will grow again!” and then they all went crazy. I also liked the part when they found out that they all were the something-est, except for one piece. I would say that I think you might really like it and you should try it if you like Mo Willems stories. I think the cover makes it look funny. Yes, because books like that are the ones that are easy for me to read but I like to have a short read sometimes so it’s nice. The Elephant and Piggy books remind me of this one. I would ask the author if they are going to make a WE ARE GROWING 2? We got in touch with Laurie Keller, and this is what she had to say:"There isn't any discussion right now of a sequel but if Mo Willems (creator of the series) and editor, Tracey Keevan, wanted to I would be open to it. In the mean time, they're working with other authors and illustrators to create more stories for Elephant and Piggie to read. I'm excited to read them, too! Thanks for your question!" And thank you for your answer, Laurie! 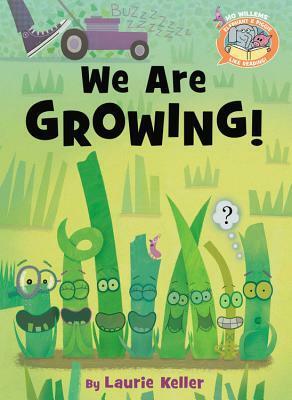 We are so excited that WE ARE GROWING just won the Geisel Award!